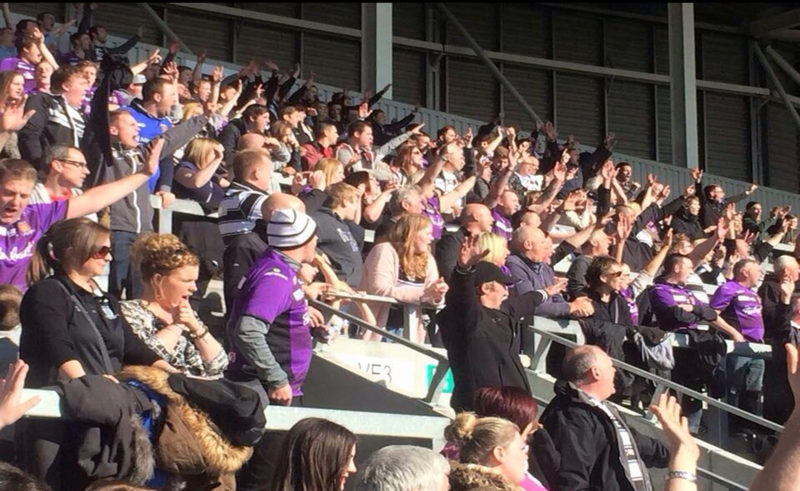 Having both lost to their bitterest of rivals in the initial Easter fixture, hosts St Helens and visitors Hull FC rallied round once again on a delightful Easter Monday afternoon to give all in attendance an entertaining contest, in the first leg of the now annual Steve Prescott Cup. Earning their second win in four years at the new and pretty lush Langtree Park, the Black and Whites, wearing their Steve Prescott Foundation inspired away jersey were thoroughly deserving of their victory, as they twice came from behind to earn two vital competition points. Playing with a vigour clearly missing in recent weeks, a bizarre selection of three hookers, and fullbacks proved decisive. The play of the ball was substantially quicker, thus giving the likes of Leon Pryce and Jordan Rankin the freedom to create time and space for the devastating pace of game-star Jamie Shaul. It was a tactic due to a lack of bodies forced upon Lee Radford, but boy it worked. Making the most of early field position, a vintage performance and play from veteran half Leon Pryce created the opening for Shaul to break the deadlock. Though, not all plain sailing further opportunities were wasted, and it proved at a cost. At the time it looked a case of de-ja-vu, Saints, clinical, found two quick scores from Tommy Makinson and Louie McCarthy-Scarsbrook to turn the game on its head. However Hull wouldn’t lie down, and having had the better of St Helens youngster Ricky Bailey all afternoon, debutant Curtis Naughton opened his account touching down in the left corner. The young Hull fullback turned winger was up there for the pick of the bunch in an instrumental debut. Carrying the ball strongly and safe under the high ball he was immense in a faultless display. Though despite the try, conversions at this stage proved costly, as one miss from Jordan Rankin ensured St Helens took a 12-10 lead into the half time break. To their credit Hull never threw in the towel and just like they have all season gave it their all. That may seem bold coming of a team with just three wins from nine, but effort and grit hasn’t been the problem, more attacking execution in the opposition red zone, but on this occasion such faults weren’t to be seen. Starting the second forty stronger, the impressive Leon Pryce gave Hull a brief lead, taking on the line to great effect before powering his way over. Ex Hull three quarter Jordan Turner then put Saints back ahead by a slender two point margin. It was a topsy-turvy affair, and justified as Hull took the lead once more, as a shift down their left edge was expertly finished by Fetuli Talanoa, before a penalty by Makinson locked the scores at 20-a-piece. 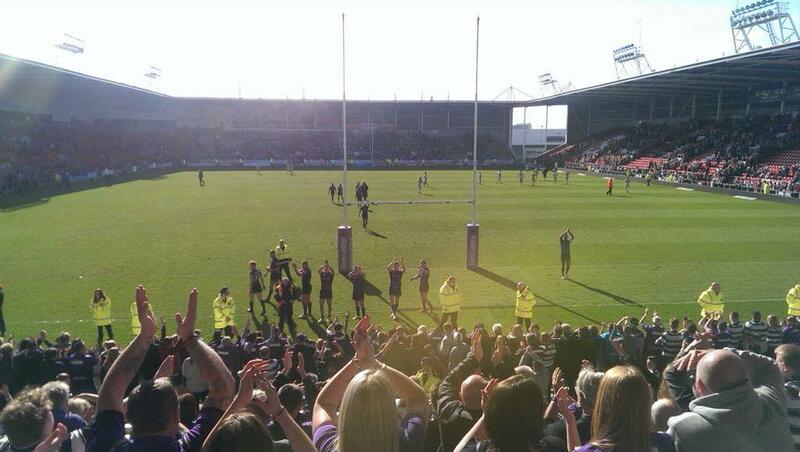 The sun beaming down on Langtree Park made for a glorious occasion, it was gridlocked. It was going down to the wire. Something had to give and it came from Hull’s talented and popular home-grown fullback Jamie Shaul. Shaul, with both injury and pecking order delaying his participation in the Hull side this year, was outstanding. Coming up with the games clincher, it was a winner out of the top draw. Turning Makinson inside and out he left the makeshift fullback for dead, as he sprinted to the line before jumping into the Hull crowd for a frantic celebration. It was relief, as a massive shout of ‘Old Faithful’ was yelled from the terraces. They knew the win was in the bag. 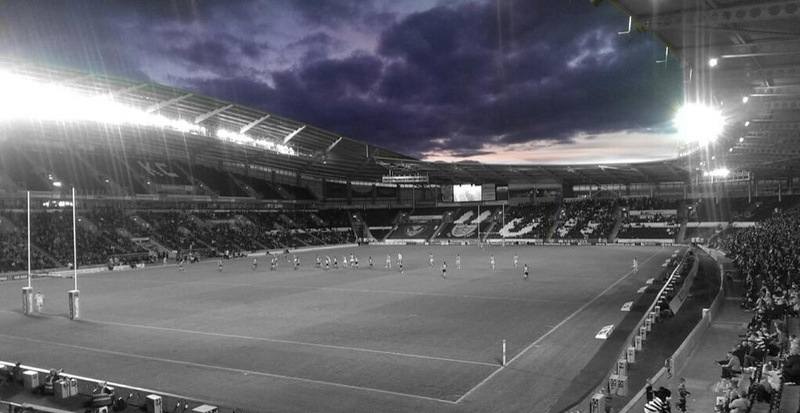 Hull were fantastic, they attacked with a threat, and defended heroically. Forget the troubles of St Helens, the visitors were also on their last resources. Not that it mattered. Rankin added a further two points from a penalty and that was that. Game over, with the Black and Whites deservingly taking it 28-20. St Helens Starting XIII: 2. Tommy Makinson, 33. Ricky Bailey, 22. Matty Dawson, 28. Jack Ashworth, 5. Adam Swift, 3. Jordan Turner, 16. Lance Hohaia, 10. Kyle Amor, 9. James Roby, 8. Mose Masoe, 4. Josh Jones, 13. 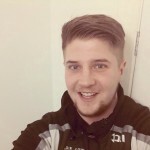 Louie McCarthy-Scarsbrook, 25. Andre Savelio. Interchange: 14. Alex Walmsley, 15. Mark Flanagan, 18. Luke Thompson, 19. Greg Richards. Hull Starting XIII: 1. Jamie Shaul, 2. Tom Lineham, 19. Steve Michaels, 5. Fetuli Talanoa, 20. Curtis Naughton, 6. Leon Pryce, 32. Jordan Rankin, 8. Mickey Paea, 34. Stuart Howarth, 22. Josh Bowden, 17. Dean Hadley, 12. Mark Minichiello, 13. Joe Westerman. Interchange: 9. Danny Houghton, 14. Feka Paleaaesina, 16. Jordan Thompson, 23. James Cunningham.